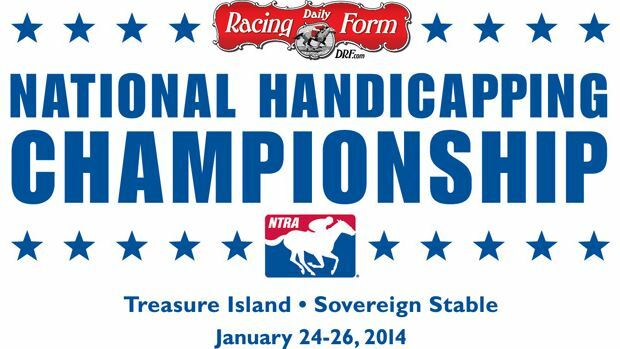 The National Thoroughbred Racing Association (NTRA) announced today that Daily Racing Form (DRF) has extended its title sponsorship of the Daily Racing Form/NTRA National Handicapping Championship Presented by Sovereign Stable and Treasure Island Las Vegas (NHC) and the DRF National Handicapping Championship Tour. Daily Racing Form has served as title sponsor of the NHC since the event’s inception in 2000. Total purse of the upcoming January 2014 NHC is guaranteed to be at least $1.5 million, with an estimated $750,000 to the winner. The NHC winner also is recognized as the National Handicapper of the Year at the annual Eclipse Awards honoring Thoroughbred racing’s human and equine Champions. “We thank Daily Racing Form for its loyal support of the richest and most prestigious handicapping tournament in the world,” said NTRA president and CEO Alex Waldrop. “The NHC would not be what it is today without DRF. In its 15th year, the Daily Racing Form/NTRA National Handicapping Championship is the most important tournament of the year for horseplayers. There are no “buy-in” entries at the NHC. It is the culmination of a year-long series of NTRA-sanctioned local tournaments conducted by racetracks, casino racebooks, off-track betting facilities and horse racing and handicapping websites, each of which sends its top qualifiers to the national finals.Each year, the NHC winner joins other human and equine champions as an honoree at the Eclipse Awards. The 14 NHC Champions since the event’s inception, in chronological order, are Steven Walker, Judy Wagner, Herman Miller, Steve Wolfson Jr., Kent Meyer, Jamie Michelson, Ron Rippey, Stanley Bavlish, Richard Goodall, John Conte, Brian Troop, John Doyle, Michael Beychok and Jim Benes. The NHC Tour is a yearlong bonus series offering additional prize money and qualifying berths to the DRF/NTRA National Handicapping Championship. Tour members receive NHC Tour points for top finishes in NHC qualifying events held during the year. In addition to potential prize money and berths in the NHC, benefits for NHC Tour members include automatic enrollment in the Horseplayers’ Coalition. The Coalition seeks legislative and regulatory solutions to tax and business issues that impact pari-mutuel racetracks and their customers and provides grass roots support for the NTRA’s lobbying efforts on Capitol Hill. Tour members also are automatically eligible to participate in NTRA Advantage, offering preferred pricing on products and services from leading suppliers, including John Deere, Sherwin-Williams, UPS, Valvoline and OfficeMax. NHC Tour membership is mandatory in order to earn an entry into the NHC Finals—the lucrative culmination of the year’s qualifying schedule. Signups for the 2013 NHC Tour are now being accepted at /en/nhc/become-a-member/. There is a one-time 2013 membership fee of $50. The complete rules are posted at /en/nhc/official-rules/. Daily Racing Form, “America’s Turf Authority since 1894” for Thoroughbred racing horseplayers and professionals throughout North America, is the Thoroughbred industry’s dominant multi-channel media company. Daily Racing Form’s mission is to serve the horseplayer and the industry with complete coverage of Thoroughbred racing, including news, analysis, handicapping and wagering tools, breeding statistics, opinions and industry reports. Launched in Chicago on November 17, 1894, Daily Racing Form is the only daily newspaper in the U.S. dedicated solely to the coverage of a single sport, publishing up to 2,000 unique pages of statistical and editorial copy every day, in as many as 30 daily editions, 364 days a year (with the exception of Christmas Day). Its companion website, www.drf.com, is the most heavily trafficked horseracing destination, providing players with interactive past performances and exclusive handicapping and wagering tools. Daily Racing Form is the nation’s largest publisher of individual track’s daily Thoroughbred Track Programs and it also serves the Harness racing industry publishing the Daily Harness Program and Harness Eye. Daily Racing Form is a premiere brand within the Sports Information Group LLC (SIG) portfolio, together with sports data and fantasy game companies StatFox and Head2Head.